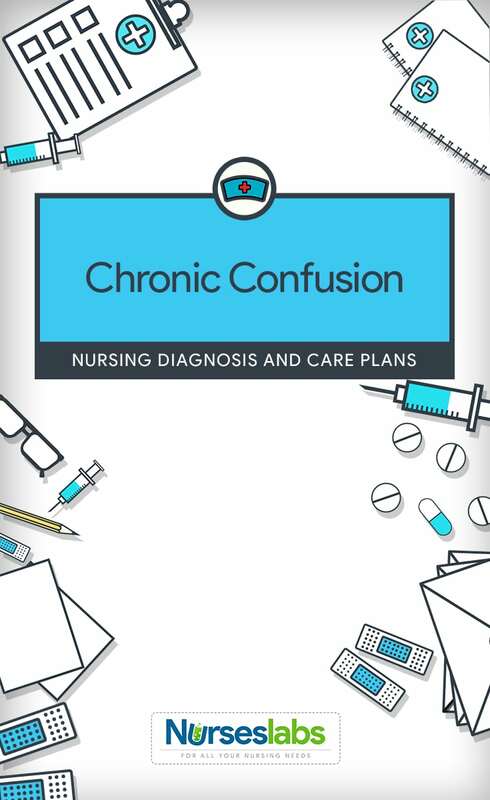 This is a care plan guide for the Chronic Confusion nursing diagnosis. Chronic Confusion is defined as an irreversible, long-standing, and/or progressive deterioration of intellect and personality characterized by decreased ability to interpret environmental stimuli, decreased capacity for intellectual thought processes, and manifested by disturbances of memory, orientation, and behavior. Medical dictionaries define confusion as a state of disturbed consciousness, with disruption of thought and decision-making capacity. Confusion can be classified into two categories: acute confusion also called delirium and chronic confusion also called dementia. Acute confusion often has an abrupt onset, over hours or days and is associated with an identifiable risk factor or cause. Chronic confusion, in contrast, is a long-term, progressive, and possibly degenerative process and occurs over months or years. Both categories can befall in any age group, gender, or clinical problem. Chronic confusion is progressive and variable in nature and may usually involve problems with memory recall, problem-solving, language, and attention. Also, there can be difficulties with perception, rationalizing, judgment, abstract thinking, communication, emotional expression, and the performance of routine tasks. Depression, brain infections, tumors, head trauma, multiple sclerosis, abnormalities resulting from hypertension, diabetes, anemia, endocrine disorders, malnutrition, and vascular disorders are examples of illnesses that may be linked with chronic confusion. With chronic confusion, the patient experiences a gradual but progressive decline of cognitive function. Patients also encounter problems in communication, ADLs, and emotional stability. Chronic confusion can have a great impact on family members and family processes as the patient needs more direct supervision and care. 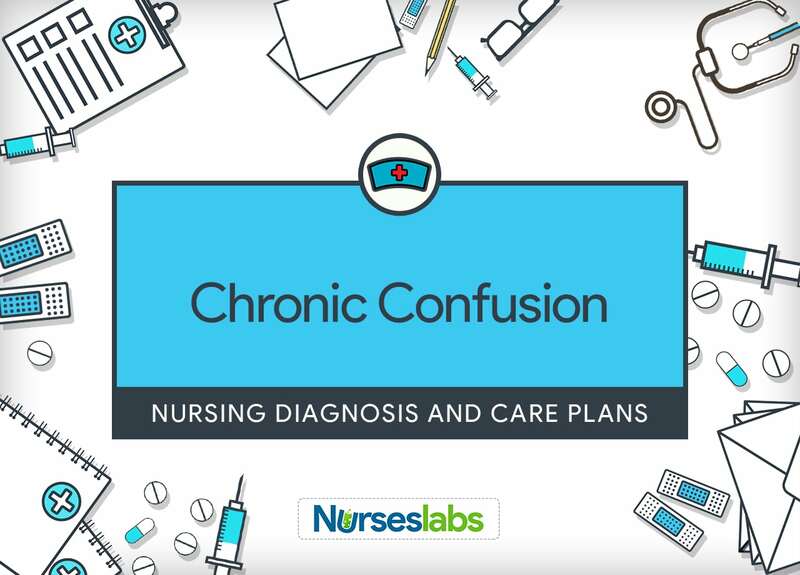 Nurses need to be knowledgeable regarding the needs of patients experiencing chronic confusion and also learn more about its characteristics, risk factors, causes and strategies to assist families in dealing with this growing population of patients. Patient remains content and free from harm. Patient functions at a maximal cognitive level. Patient participates in activities of daily living at the maximum of functional ability. Family members or significant others verbalize understanding of disease process and prognosis and the patient’s needs, recognize and engage in interventions to deal completely with the situation, and provide for maximal independence while meeting safety needs of the patient. Collect information about patient functioning, including social situation, physical condition, and psychological functioning. Knowing the patient’s background can help the nurse identify agenda behavior and use validation therapy, which will provide guidance for reminiscence. Background information may help the nurse to understand the patient’s behavior if the patient becomes delusional and hallucinates. Evaluate the level of impairment: The level of confusion will determine the amount of reorientation and intervention the patient will need to evaluate reality accurately. The patient may be awake and aware of his or her surroundings. Review responses to diagnostic examinations (e.g., memory impairments, reality orientation, attention span, calculations). Using a standard evaluation tool such as the Mini-Mental State Examination (MMSE) can help determine the patient’s abilities and assist with planning appropriate nursing interventions. The Confusion Assessment Method (CAM) is a valid and reliable instrument that can help monitor changes in the patient’s cognitive function. Examine the ability to receive and send effective communications. Ability/readiness to reply to verbal direction/limits may vary with the degree of orientation. Observe decline and variations in personal hygiene or behavior. This information assists in promoting a particular program for grooming and hygiene activities. Communicate with family members or significant others regarding the progression of the problem, prognosis, and other concerns. These determine areas of physical care in which the patient needs support. These areas include nutrition, elimination, sleep, rest, exercise, bathing, grooming, and dressing. The patient may have the ability and minimal motivation, or motivation and minimal ability. Assess the patient for signs of depression: insomnia, poor appetite, flat affect, and withdrawn behavior. Patients with chronic confusion may have depressive symptoms. Assess for sundown syndrome. This phenomenon associated with confusion happens in the late afternoon. The patient displays increasing restlessness, agitation, and confusion. Sundowning may be a manifestation of sleep disorders, hunger, thirst, or unmet toileting needs. Determine the patient’s anxiety level in connection with the situation. Observe behavior that may be suggestive of a potential for violence. Confusion, disorientation, suspiciousness, impaired judgment, and loss of social inhibitions may result in socially inappropriate/harmful behaviors to self or others. The patient may have poor impulse behavior control. Place an identification bracelet on the patient. Patients with chronic confusion may wander and can become lost; identification bracelets increase patient safety. Avoid exposing the patient to unusual situations and people as much as possible. Maintain continuity of caregivers. Maintain routines of care through established mealtimes, bathing, and sleeping schedules. Send a familiar person with a patient when the patient goes for diagnostic testing or into unfamiliar environments. Situational anxiety associated with environmental, interpersonal, or structural change can intensify into disturbed behavior. Any extraneous noise and stimuli can be misinterpreted by the confused patient. Images on walls may be threatening for the patient. Promote reality-oriented relationships and environment (e.g., display clocks, calendars, personal items, seasonal decorations). Orientation to one’s environment increases one’s ability to trust others. Encourage the patient to check the calendar and clock often to orient himself or herself. Familiar personal possessions increase the patient’s comfort level. Talk to the patient using simple, concrete nouns in positive terms. Allow family members to orient the patient about current news and family events. A confused patient may not completely understand what is happening. Increased orientation promotes a greater degree of safety for the patient. Keep the environment quiet and nonstimulating; avoid using buzzers and alarms if possible. Reduce sights and sounds that have a high potential for misinterpretation such as buzzers, alarms, and overhead paging systems. Sensory overload can result in agitated behavior in a patient with chronic confusion. Misinterpretation of the environment can also contribute to agitation. This can be threatening for the patient and can result in a defensive reaction. Approach patient with a caring, friendly, and accepting attitude and talk calmly and slowly. Patients can sense feelings of compassion. A calm, slow manner projects a feeling of comfort to the patient. Promote participation in resocialization groups. This promotes a sense of responsibility and independence. Ensure that the patient is in a safe environment by eliminating possible hazards such as pointed objects and harmful liquids. Patients with chronic confusion lose the ability to make good judgments and can easily harm self or others. Allow the patient to reminisce, existing in his or her own reality if not detrimental to the patient’s well-being. Depending on the cause, long-term memory is usually retained longer than short-term memory. This approach can be enjoyable for the patient. Provide repetitive hand activities. Involving the patient in safe, repetitive activities occupies the patient’s mind and hands. The activities may reduce agitation and provide release of energy (e.g., fold and refold towels and washcloths). Present one simple direction at a time and repeat as necessary. People with chronic confusion need time to understand and interpret directions. Break down self-care tasks into simple steps. Confused patients are incapable to follow complicated instructions; breaking down an activity into simple steps makes completing the activity more achievable. Let the patient eat in a peaceful environment with a smaller number of people. The noise and confusion in a large dining room can be overwhelming for a confused patient and can result in agitated behavior. Give finger food if the patient has difficulty using eating utensils or if unable to sit to eat. Feeding oneself is a complicated task and may prove challenging for someone with chronic confusion. Help the family and significant others in developing coping strategies. Determine family members’ resources and their availability and eagerness to participate in meeting the patient’s needs. The family members need to let the patient do all that he or she is able to do. This approach will maximize the patient’s level of functioning. Refer family to social services or other supportive services. To assist with meeting the demands of caregiving for older patients. Encourage family to make use of support groups or other service programs. Community resources provide support, assist with problem-solving, and reduce the demands associated with caregiving. Validate the family members’ feelings with regard to the impact of patient behavior on family lifestyle. Validation lets the patient understand that the nurse has heard and realizes what was said, and it improves the nurse-patient relationship. Encourage family to include patient in family activities when desirable. These steps help the patient maintain dignity and lead to familiar socialization of the patient.